I don’t wish to speak ill of the dead, and I’m quite prepared to accept that Mr. Flaherty was a good friend to those who agreed with his values or contributed money to Conservative Party causes. He may have enjoyed petting bunnies, for all I know. In private life, Flaherty was a short Irish Catholic who went to Princeton on a hockey scholarship, and a good father and husband, as far as that’s possible given his political career. He was also an enthusiastic anti-abortion supporter, and he was a man who once seriously proposed that Ontario should make homelessness illegal. By profession, he was a lawyer, and when he left politics to return to his private legal practice, it was to a law firm that carries his name and his wife’s name, Ontario MPP Christine Elliot. The firm specializes in ambulance chasing. As a public figure Flaherty held a series of cabinet posts during the unlamented Mike Harris era in Ontario provincial politics, and was Harris’s last finance minister. He then went on, as Stephen Harper’s finance minister for eight years, to do everything he could to transform Canada’s taxation and governmental systems into replicas of those in the United States, presiding over a profound and catastrophic income shift to the very rich that has been nearly as extreme as that perpetrated in the United States. Among his accomplishments were cutting $36 billion from federal health funding, and making our corporate tax rates the lowest among G-8 countries. Under his watch $3.1 billion disappeared from Canada’s anti-terrorist funding programs, which tells you something about his grasp of fiscal accountability you probably don’t want to know. While it is possible that we have Flaherty to thank for rejecting Harper’s election promise to offer still more tax benefits to the wealthy by allowing income splitting, I can’t think of much else he did for Canada that wouldn’t make Tea Party members south of the border feel warm and fuzzy. 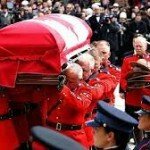 Canada has held 37 State Funerals since 1867, all but five of them for those formally qualified: former Prime Ministers, Governor Generals, and cabinet ministers who died in office. Three of the other five State Funerals have taken place in the last three years: one for Jack Layton in 2011, one for Nelson Mandela in 2013, and now Flaherty’s. There’s some small consolation that Stephen Harper chose a wildly inappropriate funeral location for a staunch Irish Catholic like Flaherty: it was held in St. James Anglican cathedral, probably because it offered the best set for imperial pompousness that English Canada has. 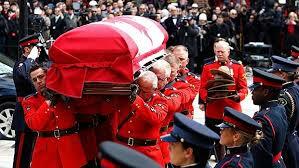 That Harper graced Flaherty’s memory with a state funeral at all would have been far more appropriate had the ceremony been held in the United States, which Flaherty did his best to bring across the border. My vote would have been to hold it in Arkansas, whose former governor Mike Huckabee not so long ago congratulated Canada for doming our National Igloo against global warming. Jim Flaherty seemed to have roughly the same understanding of Canadian institutions, and the country’s best interest.